A native of Colorado, Pat Dorsey has been guiding for over 25 years. He spends approximately two hundred days a year on the water, a combination of guiding customers, hosting trips, and personal days on the water. Pat is the head guide and co-owner of the Blue Quill Angler fly shop in Evergreen, Colorado. He oversees and trains more than 25 guides, setting the standard for integrity and professionalism in the Blue Quill Angler guide operation. Dorsey also, maintains an online stream report that monitors stream flows and conditions for the Blue, Colorado, South Platte (Cheesman, Deckers, Spinney Mountain Ranch, and Elevenmile Canyon), North Fork of the South Platte, and Williams Fork rivers. Pat Dorsey is a Simms Ambassador, a member of the Sage Elite Pro Team, Orvis Pro Team Member, Yeti Pro staff, and Scientific Anglers pro staff. 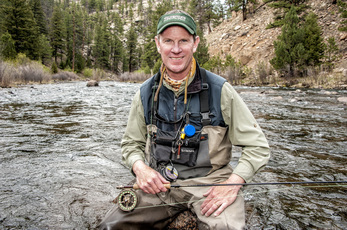 Pat Dorsey is the Southwest Field Editor for Fly Fisherman Magazine. In 2009 Pat Dorsey authored Fly Fishing Tailwaters, a comprehensive book on how to fish tailwater fisheries. In 2010 a companion book to Fly Fishing Tailwaters hit the shelves, Tying and Fishing Tailwater Flies, which is jam-packed with how to tie Pat Dorsey’s favorite “guide flies”. This book includes 500 step-by-step tutorials, as well as, helpful tips and illustrations on how to rig and fish them. His latest book is Colorado Guide Flies, which was released in 2015. It features tips from the state’s best guides and includes approximately 600 proven guide flies with recipes.